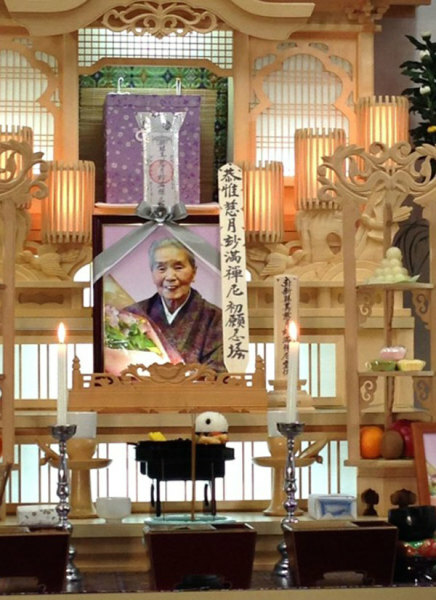 “So many of you expressed your love for and remembrances of Mitsu Suzuki upon hearing of her death on January 9, 2016 that I wanted to tell you about the beautiful ceremonies that were held for her in Japan, which I attended,” writes Central Abbess Eijun Linda Cutts. “Here is my description of the funeral events. I have attempted to include many details so that you too might have the feeling of what the ceremonies were like. I arrived in Japan�where it was cold and wintry�late on January 11 after having quickly booked a flight in order to be in time for the ceremonies for Suzuki-sensei at Rinso-in, Suzuki-roshi�s temple, on the afternoon of the 13th and the morning of the 14th. After a bit of time in Tokyo to get over the jet lag, I headed to Yaizu, where Rinso-in is located, traveling through Shizuoka on a bullet train that allowed a spectacular and unexpected view of Mt. Fuji rising up out of the clouds. Shizuoka, about 20 minutes from Yaizu, was Okusan�s home town, which was heavily bombed during World War II. 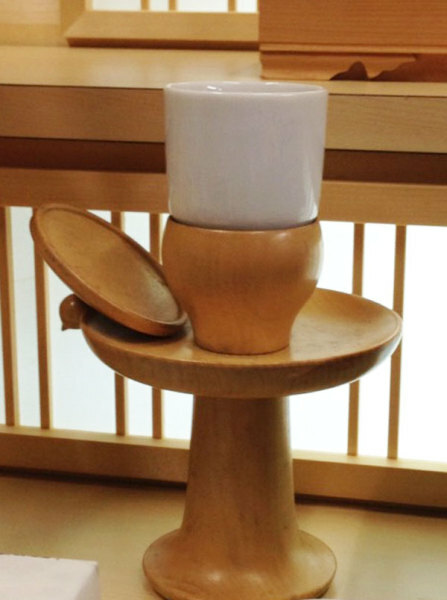 I read Okusan�s book, A White Tea Bowl: 100 Haiku from 100 Years of Life, all the way, enjoying being in Japan while reading the evocative poems. When I arrived at Rinso-in I was greeted warmly by Hoitsu Suzuki-roshi, Shunryu Suzuki-roshi�s son and abbot of Rinso-in; Chitose-san, Hoitsu-roshi�s wife; Shungo-san, Hoitsu-roshi�s son, who is also a priest at Rinso-in; and Kumi-san, Shungo-san�s wife. Narumi-san and Kaiyoko-san (Hoitsu-roshi and Chitose-san�s daughters) were also there and I was introduced to them. Chitose-san brought me immediately into the room where Okusan was lying in state on the tatami, surrounded by many large pots of white Phalaenopsis orchids, and abundant bouquets of flowers tied with pink ribbons�Okusan�s favorite color was pink. 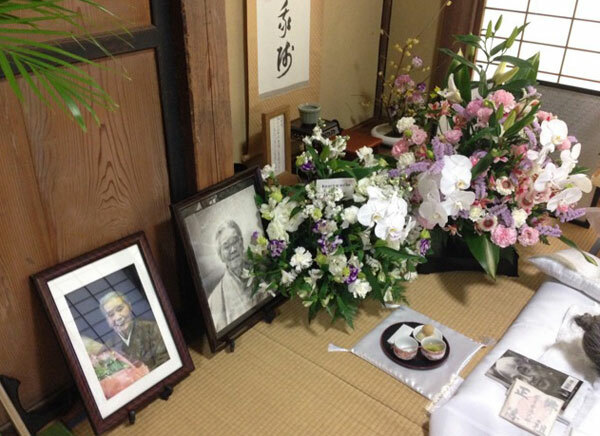 Next to her side were her lineage papers, a picture of Suzuki-roshi (the photo on the back of Zen Mind, Beginner�s Mind), an offering tray with food and tea, and some beautiful white handkerchiefs with pink flowers on them. Over her was a white coverlet, and placed on that was a dagger in a red brocade case. Next to her was an altar with candle, censers for stick and chip incense, a bell, flowers, and beautiful bowing mat, and another small table altar with a chip censer (kobako) and her picture. I was able to offer incense, bow, ring the bell, and chant the Dai Hi Shin Dharani (Dharani of Great Compassion). How very quiet and peaceful to be there sitting alone by her side for a while, knowing how many people were also thinking of her, remembering her, and feeling sad not to be able to be there at this time. The ceremony on the afternoon of January 13 was called a Tsuya, which translates into English as �wake�. 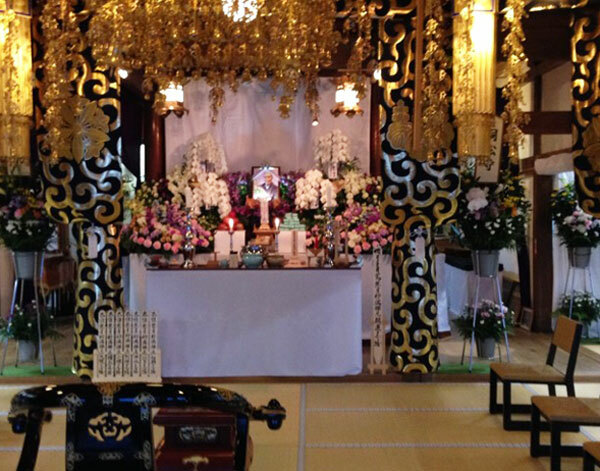 Both the Tsuya and the funeral preparations were massive, and yet the daily life of the temple went on as well. It happened to be (completely unrelated to the funeral ceremonies) a day in which Rinso-in is host to priests connected with the temple for a traditional ceremonial New Year�s meal. On top of all of the preparations for the funeral ceremonies there was a formal meal being cooked and served to 25 or more priests. The kitchen was filled with activity as Chitose-san, Kumi-san, Narumi-san and Kaiyoko-san, as well as other helpers, were cooking, serving up, and bringing things in to the dining area on trays. As this was a ceremonial meal there were two red lacquer offering trays with many small offering bowls, and many courses, including the New Year�s sweet red bean soup with mochi. So much activity in the kitchen . . . Meanwhile, in the other part of the temple, many workmen and women were arriving to transform the Buddha Hall for the ceremonies. There was a special carved wood altar installed, white knotted cord ties replaced the red cords on the large brocade drapery in the Buddha Hall, and many bouquets of flowers with calligraphy written on placards on wooden sticks were set in the flower pots. There was a microphone set up, tables for the priests to �register� when they came in, and particular flower arrangements on the main altar, etc. After the New Year�s special meal ended, other people began to arrive, including Yasuko-san, Suzuki-roshi’s oldest daughter, the extended family members, lay temple members (danka), and many other priests. As people arrived, they offered donations in honor of the deceased, which were all carefully recorded for the temple and family. Everyone who came brought gifts and donations, and both the priests and lay members received bags with gifts when they arrived or when they left. The priests, carrying their robes in small luggage, were shown to a special room and were immediately served treats and snacks of various kinds, including okashi tea cakes and lots of hot green tea brought in on trays by the danka. The ceremony was an occasion of expressing generosity and giving from the family and the temple to the supporters, priests and friends. And they in turn expressed generosity and support and condolences to the temple and family�one circle of giving, receiving, and gifts. While these preparations were going on, Okusan was being prepared to be placed in her coffin for the Tsuya ceremony, and I was invited into the room with the family during this very intimate time. Hoitsu-roshi and Shungo-san, Chitose-san and the children and grandchildren gathered around as she was readied for the next part of her �long journey�. I was able to help in this traditional ceremony of preparation. Straw traveling sandals were put on her feet, and her hands were covered with white cotton cloth squares that were tied on, and then her hands were crossed over her chest. She also received a white cotton �purse� and we all put shiny coins into it for �paying at the river�. She had a small white cloth tied onto her head to protect her. Her dagger was again placed, and a slender white wooden staff was tucked beside her. Okusan was then lifted from the tatami into a petite white�almost pink�brocade coffin, and the white coverlet was placed carefully around her. The lid was put on and there was a window that was open so we could see her face. 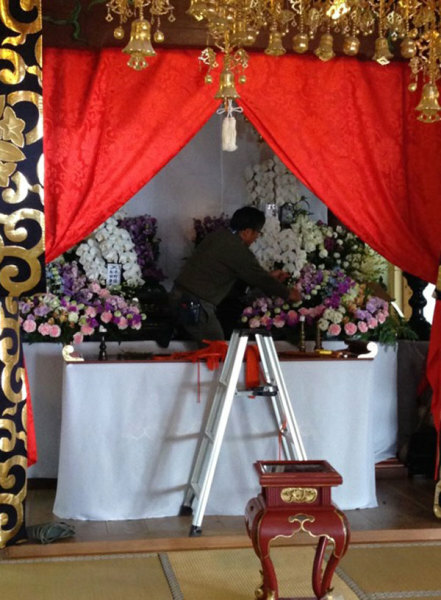 The coffin was then brought to the main area in front of the delicately carved wooden altar that had been brought in for the ceremony.� All the white orchids and other large flower arrangements were moved to the ceremonial space and placed around the coffin. As people arrived they expressed their condolences, came forward and offered incense and respectfully viewed the body. For the Tsuya ceremony the family and laity knelt (seiza) on cushions as well as sat on stools, and the priests sat in the next room in seiza. There were nine officiants (doshis), for the ceremony, which was mainly incense offering and the chanting of the Nirvana Sutra, which is quite long and was done very vigorously. During the chanting, the assembly offered chip incense at their seats, with about twenty censers (kobakos) passed down the rows. There were other chants offered too. Hoitsu-roshi spoke after the ceremony in his relaxed and heartfelt way and thanked people for coming. After the Tsuya many people left, and family and some invited priests stayed for a meal that had a festive and warm feeling. I stayed at a hotel in Yaizu with other priests and we arrived back at Rinso-in at about 9:30 am for the 11:00 am funeral ceremony. We were shown to the priest waiting room and were served tea and okashi while waiting to put on our robes for the ceremony. Shungo-san told me I would be one of the speakers, and trained me that morning in how to approach the altar, bow to the main doshi and the altar, offer incense before speaking, incense the statement, and wait in gassho while the translation of my statement was being read. I had my statement written out on stiff paper which I carried in the front of my robe. The densho bell announcing the ceremony was about to begin and everyone came into the ceremonial hall�family and laity in one section and the priests in another. Nine doshis conducted the funeral, which included chanting of the Dai Hi Shin Dharani, the 25th chapter of the Lotus Sutra (also called the Kannon Sutra), and the Verse of Homage to Buddha�s Relics (Shariraimon).� There was an inkin, drum, and cymbal ensemble, which was played at least three times at different points of the ceremony. Kobakos were also passed for the assembly to offer chip incense. The nine doshis left the hall at one point and returned with three of them in black ceremonial robes wearing ceremonial hats. They made offerings of sweet tea and water and food in white ceramic cups in plain wooden holders. The careful, respectful and dignified ceremony, attended by over two hundred people, paid tribute to Okusan and also to Hoitsu Suzuki-roshi and his family, and to the 500-year-old temple Rinso-in. Right after the ceremony a number of people began to gather many of the white blossoms from the bouquets so that they could be nestled into the coffin all around Okusan. She looked so cozy with the many flowers around her face and all over her little body. The great-grandchildren, some as young as five, participated enthusiastically in this ritual, and also touched her face and seemed quite settled with the ordinary activities of life and death. After the coffin left, there were many buses that took people�mostly family�to the crematorium. The facility was ready for us and everyone went right to the room where the retort was. We all chanted while she was put into the fire. After that we were led to a large waiting room where another altar was set up, with Okusan�s picture, memorial tablet (ihai), a large ceramic urn that was a beautiful jade green with flowers and Okusan�s picture embedded in the glaze, and small brocade bags with ceramic urns. As we waited during the time of the cremation, a light lunch was served with a variety of refreshments. We waited and ate and chatted in this room, all the while being aware of what was happening in the fire. After about an hour and a half it was announced over the loudspeaker that the Suzuki family should to come to another room. There was another ceremony in which the newly revealed ashes were placed in the jade green urn with everyone present chanting and helping. And the fierce love and gratitude we have for you. And what it means to live with compassion and devotion.